He sounds like any other teenager but with one important difference - Cameron is rebuilding his life after becoming homeless at just 14. He is part of what one of Wales' biggest charities called a "hidden epidemic" of youth homelessness. Stories like his inspired actor Michael Sheen to help set up Wales' first national out-of-hours helpline. Cameron, not his real name, said his relationship with his family broke down so badly he had to leave. He slept on friends' sofas and spent a night on the streets. "It was quite sudden, it was a lot of stress... I panicked, I didn't know where to go or what to do. It was overwhelming," he said. "When I left I had a spare set of clothes and that was it. I didn't have much money or anything, it was difficult." "When things started to kick off at home, my grades were dropping and my behaviour was getting out of control," he said. "In the end, the school asked me to leave, which didn't help my situation, because the problems I was having at home were a lot harder. "I wasn't happy, I was fighting back against everyone and everything. I lost a few friends and opportunities." Cameron did not know where to find help or who to talk to - something other young people told Hollywood star Michael Sheen when he spoke with them about youth homelessness. 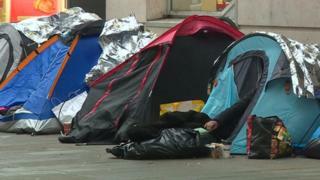 Welsh Government statistics show 7,584 young people, aged between 16 and 24, approached their local authority for help with homelessness in 2017-18 - an increase of 23% from 2015. Frances Beecher, from Llamau, said: "Homelessness is a hidden epidemic and what is so scary is that 76% of homeless young people have no idea where to turn. "This helpline is trying to respond to what young people are asking for - a helpline in Wales and to raise understanding of problems young people are facing today." Public donations and Nationwide Building Society have raised more than £90,000, securing the helpline for a year. Image caption Frances Beecher said the helpline was "trying to respond to what young people are asking for"